Happy Thursday loves! Sorry for my absence yesterday! I ended up unexpectedly going out for dinner and drinks Tuesday night and then came home and HAD to watch PLL before going to bed and I had a doctor's appointment Wednesday morning so it was just easier to skip out yesterday than try to cram a post in. But I'm back today and I'm sharing one of my favorite weekend looks with you! It's been warmer here the past few days so I've been loving getting to wear more spring weather clothing. My black ripped skinny jeans are some of the most comfy jeans I own so I love when it's a teensy bit warmer out so I can rock them without being too cold! I got this tank top for Christmas and I am still so in love with it! It's soft and flowy and the ruffled hem dresses it up from being a plain tank top. I love it so much that I really think I want to scoop it up in some of the other colors, especially since it's on super sale right now! Since it was still a bit on the cooler side I threw on my denim jacket and favorite wedge booties to top off my look. What is your typical go-to weekend outfit? Those pants are amazing and you look so adorable in them! I am totally into black pants right now and I love cropped too! These jeans are perfection, I so need to find a pair like this! Eh, life happens and sometimes you miss a post, NBD :)! I love how girlie and tough this outfit is together. What a fabulous top! I love a good pair of comfy jeans. This outfit is the epitome of comfort but still being cute! This is a great weekend outfit! I love denim jackets and that top (and its price) is awesome! I love the jeans! This whole outfit is so cute, I need warmer weather so I can start wearing similar outfits! Such a cute top and can’t believe how inexpensive it is! Love the denim! The entire outfit is really cute! I love, love, love any sort of white relaxed peplum top. I have to get this! I love that top! It would seriously go with everything and the price point is awesome. Love this look! So cute! Love that flowy top and you can't beat that price!! Those jeans look so comfortable. 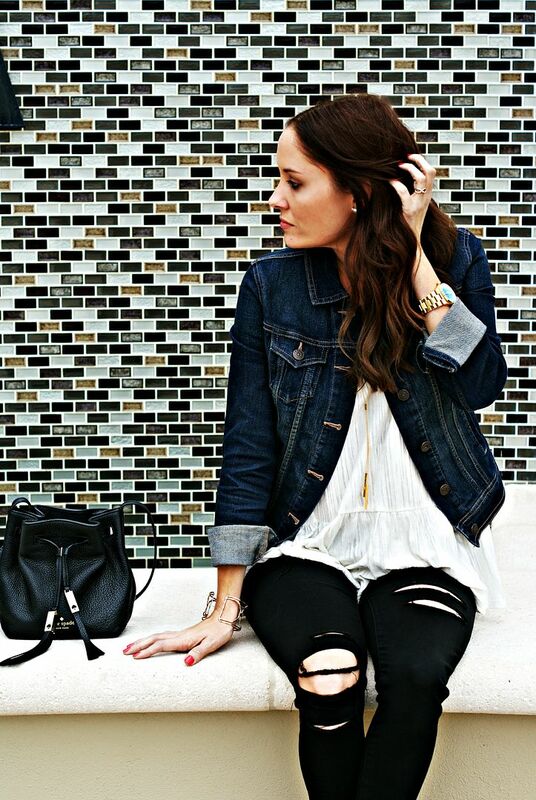 Love the mix and match of white, black and denim. Always a fan of causal yet stylish outfits like this. Love this look it's perfect for spring weather and hopefully everyone gets a dose of that real soon :)! You are always flawless! I need a new denim jacket but can never find the "perfect" one. I love the jeans and top, too! Love everything about this! Ripped black skinnies are on my to buy list for next fall!! Love the ripped skinnies, and this whole look! Can't go wrong with classic black and white. You are so darn gorgeous! :) I love that tank you're wearing- always nice that you can dress it up or down! I loooove ripped denim, and the outfit you put together is perfect. Those booties are too cute. You can't go wrong with a black/white combo! I love what you did here with the delicate top and the sassy ripped jeans!! 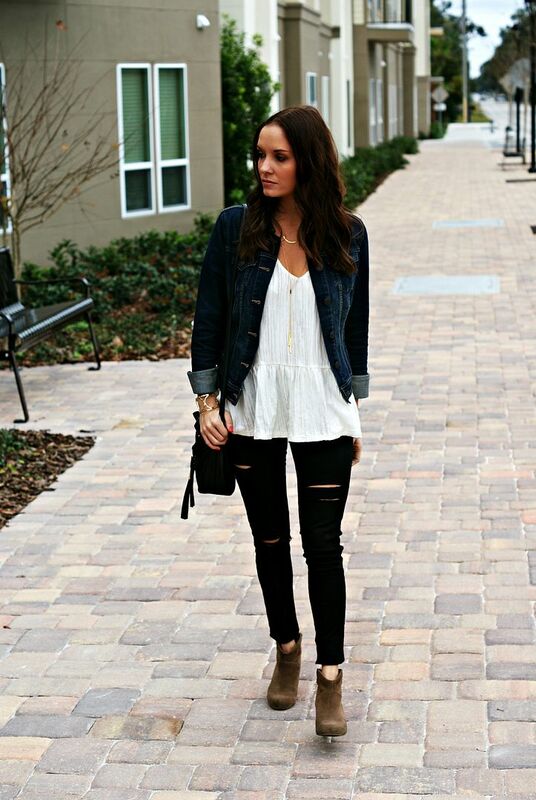 Such a cute look - can't go wrong with a flowy tank and denim jacket! These black jeans are so cute! Love it paired with the white blouse and denim jacket. Such a great look! I NEED to invest in some black jeans! It's like that instant cool-girl look. Thanks for sharing! Ugh, I still have to catch up on PLL - usually I can't wait this long but girlfriend - STUNNING! This look is great on you! Those jeans are SO cute! I need to check out AE soon! I love how you styled the jeans with the booties and everything! It's such a cute outfit and perfect for transitioning to spring!